• Repair Form – fill out our online Tool Repair Form to expedite your tool repair here. • Repair Status – submit your repair tag #, or tool serial # below to receive an update on your tool repair. • Literature – view our variety of tool & machine operation and parts manuals here. • Used Equipment – check out PAC’s selection of used strapping equipment available for purchase. Fill out our Tool Repair Form to expedite your tool repair. Fill out as much information as you can and when your tool arrives we will be able to process it as quickly as possible. All tools are disassembled and cleaned prior to repair. We then examine your tool and provide you with a repair estimate. Upon your approval, we will begin repairing your tool. If it is discovered during the repair that your tool needs additional parts you will be contacted with a revised estimate. If you find your new or original estimate unacceptable your tool will be disassembled, any installed parts will be removed, and the tool will be returned to you disassembled. We will reassemble tools for a labor fee dependent on the complexity of the repair. A bench charge applies to all tools that we inspect. 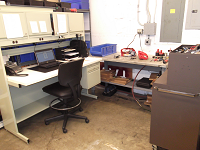 If you decide to have your tool repaired the bench charge is built into the labor cost for the repair. We charge a flat labor fee for most repairs. Call 610-363-8805 with any questions and ask for the Service Department.